UMP | University of Minnesota Press Blog: Growing up an army brat: The moves. which managed to survive so many moves. This is the second installment in a series by Catherine Madison, whose father spent three hellish years as a POW in Korea. It’s such an innocent, ageless question, one of the first things a new acquaintance asks. By the time I left for college in 1967, I had grown accustomed to watching the inquirer’s expression morph from polite interest to perplexity while I considered my answers. What does this person really want to know, I would ask myself. Where I was born? That would be Tacoma, Washington, which didn’t count because I hadn’t visited since I was nine months old and wasn’t absolutely sure I could find it on a map. Where I lived the longest? That would be San Antonio, where I lived three times, but three such disparate times that I hardly knew I was in the same city, so maybe that didn’t count either. What place I liked the best? A stumper, that. Germany was the most unusual, but Washington, DC, had its fascinations. Where did I feel most at home? Here, now, as long as the last move was at least a year ago. It takes that long to settle in. Wait. Maybe this person just wants to know where I came from the last time we moved. Nah, probably not. Ack. Three high schools, in Maryland, Texas, and Georgia. I spent my junior and senior years in Atlanta, where boys were not allowed to ask me out because we hadn’t known each other since kindergarten. I was an itinerant, suspect for my lack of roots. But my new friend probably didn’t want to know that, either. Only on military posts did no one ask, because moving was routine. One day a stack of orders would show up on the dining room table, and soon came the command to “pare down,” rummage through drawers and closets to extract non-essentials and dump them in a large wastebasket that had mysteriously appeared. Moving cost money, and boxes were limited. Once my mother decided I had accumulated too many trophies. She drove me to the Goodwill bin and watched as I removed the brass plates as keepsakes and tossed the rest. When the packing boxes arrived, I learned what fit where, like pieces of a 3D puzzle. Precious objects such as the miniature Bavarian clock my seventh-grade boyfriend had given me went on top, tucked into socks and underwear so it wouldn’t get jostled. I learned to think ahead about how the move could take weeks, and how sometimes, while unpacking later, I would realize that my affection for an object had waned. Somehow it had lost its spirit during the interim, faded and grown shoddy. Discarding it in its new home made me sad. We saved boxes for next time. Eventually their corners got crushed and different-colored tags speckled their sides. Each move had its victims. A salt shaker made it, as did its salt (wrapped neatly in an entire sheet of wrapping paper), but the silver top went missing. Glass vases shattered. A new television disappeared after a sudden storm sent movers rushing furniture into the van, and I failed to note its tag on the inventory list. Sometimes boxes were moved only to be stored in closets or basements until it was time to move again. I didn’t love moving, but I didn’t hate it, either. Each time got easier. On move-in day, my father insisted that curtains and pictures be hung and the stereo hooked up before we went to bed. Music, art, and privacy made a home, not the stuff that filled it. We assembled one room at a time, kitchen first, and pushed remaining boxes into ever-smaller areas. In two or three days we were done, launched into a new life in a new city filled with new opportunities I grew to cherish. I still pack with precision and can travel for weeks with what fits in a carry-on bag. I still save boxes, and I still have the Bavarian clock. I finally unpacked my childhood doll collection after moving it from place to place for 40 years, but I’m still flummoxed when Facebook prompts me to add my hometown. I don’t have one. We moved a lot. 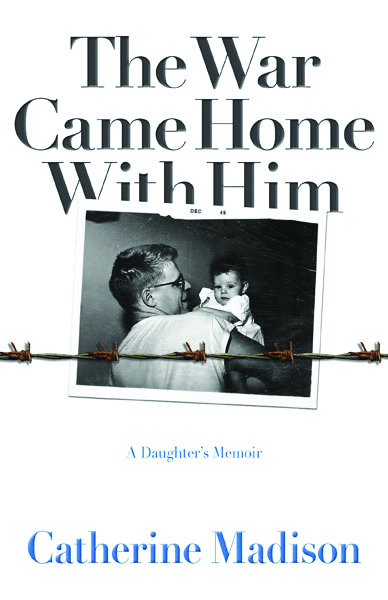 Journalist Catherine Madison is author of The War Came Home with Him: A Daughter's Memoir. She was editor-in-chief of Utne Reader, senior editor at Adweek and Creativity Magazine, founding editor of American Advertising, and editor-in-chief of Format Magazine. She has written articles for many publications, including the Chicago Tribune, Star Tribune, and Minnesota Monthly. Those are my dolls!!!! lol. Every girls dream, dad comes home, hugs her and hands her a doll. Boys got the swords or crazy knives...so jealous!